Nobody lives here. Not anymore. The Temblor bomb has only been used three times. The second was at Hyperion, on an uninhabited world to verify the weapon's development. The third was at Kilrah, at the end of the Kilrathi war. The first was at Aldrin. Aldrin has always been intimately tied to Crest Industries. In early 2631 Crest founded the Aldrin colony as a site for testing new techniques to create artificial gravity, but after the start of the Kilrathi war the colony was repurposed to serve as a site for the development of Confederation weapons technology. 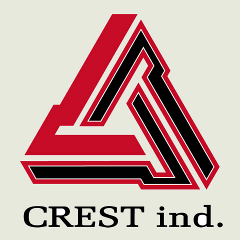 In 2667, Crest Industries won the bidding to serve as manufacturer of the Temblor bomb. One of the conditions of the manufacturing contract, was that Crest had to show they could manufacture a working weapon. When the Temblor bomb's inventor was kidnapped in 2668, this effort was placed on hold - until the inventor was rescued and returned to Crest in 2669, and the time came for Crest to fulfill its contract. Due to stricter secrecy requirements following the destruction of the TCS Behemoth, Crest was extremely limited in legal locations to test the weapon. In addition, large sections of staff who knew about the weapon were disallowed from even knowing such a project existed. Were such individuals discovered, Crest would lose the contract. A meeting of the board of directors of the company voted unanimously to solve both problems. The offending individuals were scheduled for a top secret meeting on Aldrin Prime. Without forewarning, they were the only ones on the planet when the bomb went off. Official reports said Aldrin Prime was completely evacuated at the time. The weapon performed as expected, and the planet was torn apart. The test was recorded and sent to Confederation command, who quickly OKed manufacture of two more bombs: one to be tested in Hyperion, and one on Kilrah. Following the destruction of Kilrah, all plans of the weapons were to be destroyed. Crest was subjected to numerous Confederation audits to ensure no copies of the plans remained. Unbeknownst to the Confederation, Crest's head of research had eidetic memory, and re-committed the plans to data storage in 2676. Following the Chandley incident, Crest relocated its management, basing them out of Aldrin. Mining operations commenced to recover previously inaccessible minerals uncovered by the T-bomb from the husk of Aldrin Prime. While this mining is profitable in its own right, Crest is also searching for the remnants of the meeting site, as it has not yet recovered all of the offenders' bodies and data recording devices. For now, Crest is content to wait and consolidate its forces. The cloud of asteroids that used to be (and technically is still designated as) Aldrin Prime has shown signs of manufacturing activity recently. 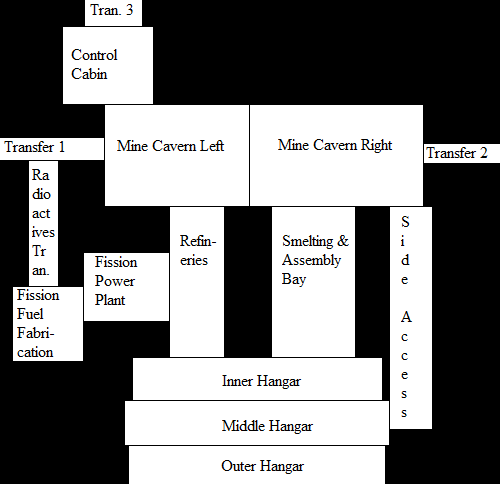 This is a rough map of a typical "entrance" asteroid, with an accessible hangar and transfer tubes to other asteroids further inside the complex.